Almost all photographic methods share the same basic technical structure (positive, negative, slide): There is a supporting material (paper, glass, plastics such as cellulose nitrate and polyester) on which lies the emulsion - the information carrier of the image. It consists of the binder (e.g. albumen - the egg white for the albumen paper, gelatine) and the light-sensitive, image-forming substance (silver halides, dyes). Depending on the process further layers are added: for example, the layer between the emulsion and carrier consisting of barium sulphate in Barite paper (DOP gelatine silver paper, b/w), a plurality of plastic layers within PE paper, protective layers in film materials. 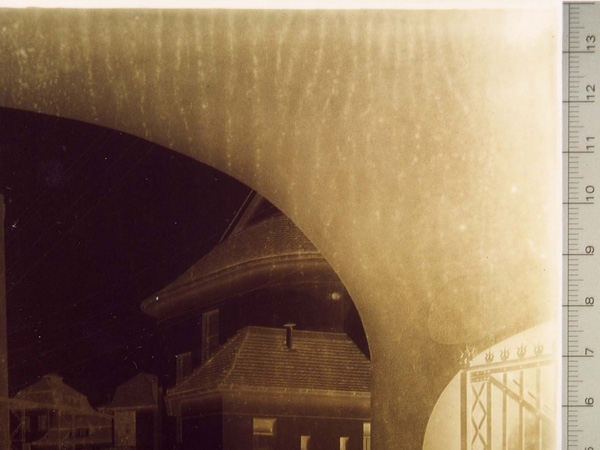 As complex the construction of photographs is, as varied are the states of deterioration. Causes may be endogenous and exogenous factors. Endogenous factors include the physical and chemical properties of the materials used, which have a strong influence on the stability. Exogenous causes of damage are due to unsuitable climatic storage conditions, improper packing materials and handling, and due to bright lighting. Generally speaking, high humidity and high temperature considerably accelerate the decomposition processes of image-forming materials and other components. Damage to positives such as cracks, kinks and flaws are caused by improper handling and/or storage. But, flaws can also result from peeling off a photograph improperly from a board, especially when a non-water-soluble adhesive was used. 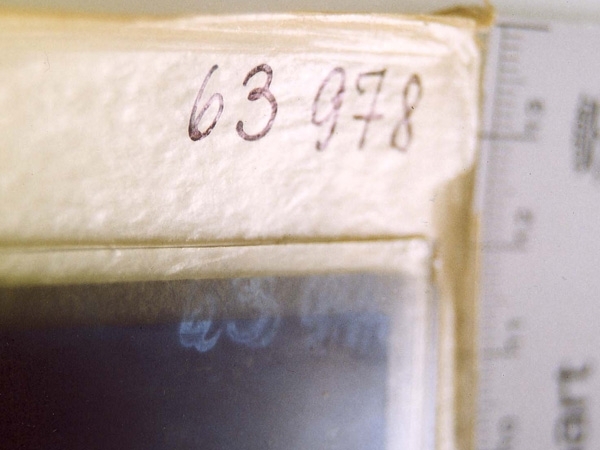 Also, labelling materials can cause damage to photographs: Seals and a pencil which is too hard can permeate through to the front of the photograph. Climate variability can lead to delamination, i.e. the emulsion peels off the carrier. The result is loss of image information, as the detached emulsion is very fragile. 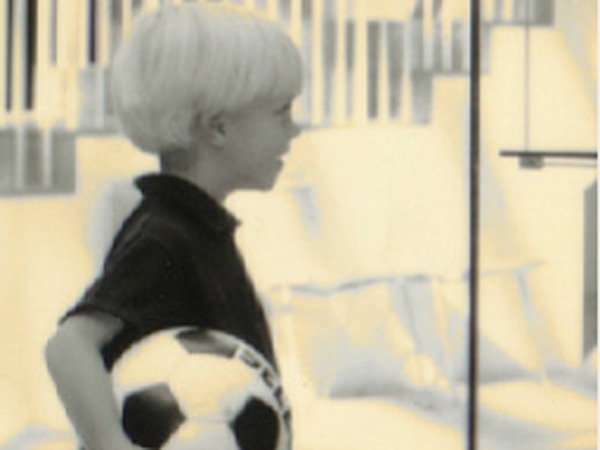 Framing of positives without a mount or spacer may result in condensation in the frame and may lead to the emulsion sticking to the glass and frame and the loss of image information through the reduction of the layer. Too high humidity (above 60 %) leads to a greatly increased risk of mould infestation.Fingerprints on the emulsion can oxidize irreversibly. This is recognizable due to an orange discoloration in this area (Fig. 1). Changes in the image-forming materials are caused through oxidising pollutants, such as peroxides or sulphur compounds and are generally irreversible, leading to an oxidation of the silver. This process is accelerated by heat and moisture. This results in freely movable silver ions that can be reduced in sequence back to metallic silver If this happens at the emulsion surface, the result is a metallic/silver shinny surface, especially visible in the dark/dense areas referred to as the silver mirror or oxidation. After PE paper is exposed to peroxides, one can observe a yellowing of the material (Fig. 2). Reddish spots can also occur, the so-called Redox stains.The above mentioned pollutants can be released by packaging material, archive furniture, flooring and wall colours. But yellow/brown discoloration of the photographs can also be the result of lignin or wood-containing materials, such as mounts. In chromogenic developed colour prints a change in colour occurs both through light exposure and storage in the dark and is caused by the chemical instability of the material i.e. the dyes and unfavourable climatic conditions. Too much exposure to light leads to a bluish tint since because magenta and yellow fade faster in comparison to cyan during exposure to light. Dark storage often results in a reddish tint as the blue and yellow dyes in the dark are more unstable than the magenta dye. This process is accelerated, in particular, by high temperatures and humidity. Similar damage patterns are observed in negative processes. 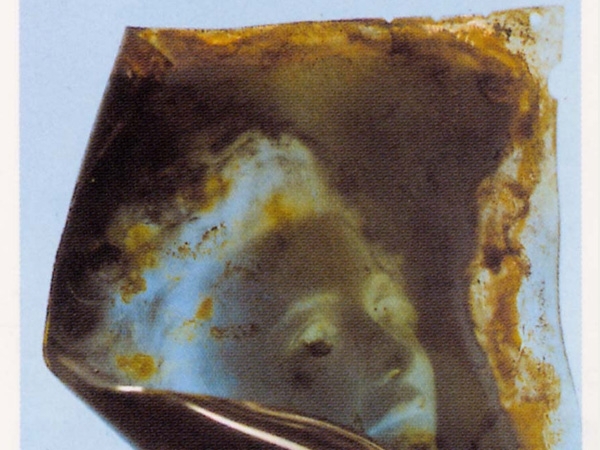 Improper storage and handling can lead to breakage of glass and defects can be caused in glass plate negatives. 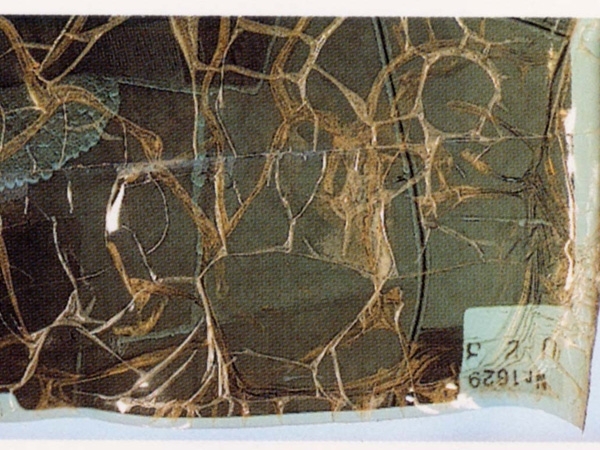 Delamination caused by climate changes may also occur. If glassine pockets are exposed to too high humidity there is a risk that the glassine becomes wavy and leaves an imprint in the emulsion. If the emulsion touches the bottom of a box or a sleeve containing lignin or a sulphur-containing adhesive, it may cause oxidation. Incorrect labelling materials (fine liner, marker etc.) 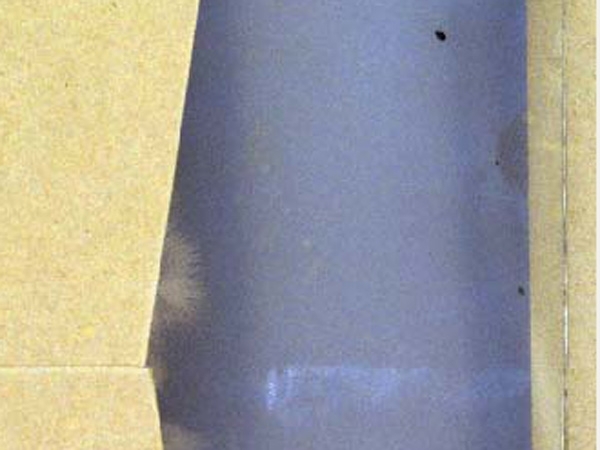 can cause change in the emulsion even through an envelope or a sleeve (Fig. 3).For chromogenic developed slides, the same damage phenomena can be identified as in chromogenic positive developed colour materials. Due to the chemical instability of the material, cellulose nitrate films are affected by decay (Fig. 5). The support material consists of nitrated cotton which is mixed with camphor as a plasticizer. The decomposition process produces nitrogen dioxide, which in combination with moisture forms nitric acid. The process is accelerated by too warm and humid climatic conditions. The packaging of these films in plastic covers results in a far worse destruction as the toxic degradation product cannot escape. With progressive degradation, the carrier shows a yellowish or amber coloration. The carrier deforms and becomes very brittle. The gelatine emulsion and silver layer are also attacked. The emulsion is softened and becomes sticky, the image fades. The resulting pollutants also destroy adjacent materials. The carrier material of acetate films consists of cellulose di- and triacetate. The decomposition process is called “vinegar syndrome”, because acetic acid is produced in the degradation. The decomposition of acetate film is recognized by the shrinking, warping and brittleness of the carrier. The emulsion can raise itself from the shrinking carrier (Fig. 6). Also significant and typical is the smell of vinegar. The degradation products can also contribute to the fading of colour materials. The inventory number should be placed at the edge of the object. Select a small stamp, if you have to apply one and also place it at the edge or outside of the image. No pens, markers, felt tip pens etc. should be used for the labelling of photographs, as they may permeate through to the front and are also not removable. In order to prevent imprints of the label to the front side, pressure should be kept to a minimum whilst writing. No self-adhesive labels, self-adhesive tape (Tesa ®, Filmoplast ®, etc. ), or post-it notes should be used on photographs, as the adhesives can contain substances which could affect the photograph, turning it yellow or brown. Positives should be labelled with a soft pencil on the back, negatives and slides on glass and film carriers on the emulsion side. • Material recommendation: Soft pencil: e.g. Mars Lumograph 100 6B Staedtler®, Schwan All Stabilo 8008. Stamp colour: Former stamp colour of the Deutsche Bundespost no. 218, source: Noris Color GmbH, Postbox 1223, 95302 Kulmbach, www.noris-color.de. Whilst handling and using photographic objects you should always wear cotton gloves. Fingerprints can be quite difficult or impossible to remove (see Fig. 1). When handling photographs care should be taken of delicate surfaces (glossy surface, unstable binder layer, hairline cracks in the layer, layer delamination) and loose bits/broken glass, as these areas are very sensitive and loss in image information can otherwise be expected. Also, loupes should not touch photographs directly, but should be placed on top of a polyethylene/polyester foil. As a matter of course, eating and drinking should not be allowed in the archives premises. Transport of objects on a trolley (even small quantities) or in a transport box is preferable to carrying the objects by hand, as damages such as broken glass etc. are avoided. separate archive room for the collection of photographs is recommended as photographs have specific requirements concerning the climate. Water pipes or sprinkler systems are potential sources of damage. Appropriate precautions should be taken for possible water damage. In the case of a fire, it is recommended to have powder based fire extinguishers or an extinguishing system using gas. An emergency plan for fast and safe recovery of the objects should also be established. There should be no copy machines, laser printers, etc. in the room, as the emitted vapours (ozone) damage the photographs. With pollutant test foils of the company Monochrom pollutants can be determined in the archive room. However, one must return the foils to the company for evaluation. Enamelled steel as a material for cabinets or shelves is to be preferred to other materials such as varnished metal, etc. Fibreboard or glue-laminated boards should also be avoided for shelf and cabinet constructions, since over time these materials can release damaging gases for photographs. The system should operate vibration-free. When packing, individual sleeves/envelopes/ four flap folders should be used to avoid friction in between. Each box should be filled with small quantities. With positives, 20 pieces of the same size on top of the other to avoid dents. With glass plates there should be not more than 15 objects per box to minimize the weight. Glass plate negatives with a size of up to 18 x 24 cm should be stored standing upright, larger formats should be stored lying flat one above the other in smaller amounts of up to 10 pieces. Only especially designated packaging materials for photographic archival storage which have passed the Photographic Activity Test (PAT) in accordance with the ISO 18916:2000 are to be used. 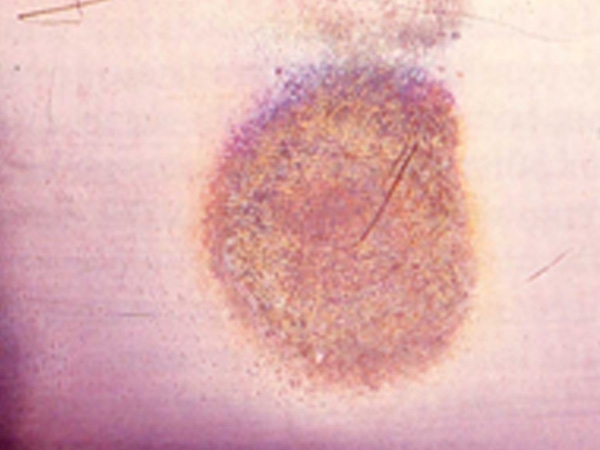 The test indicates whether a material has caused chemical reactions in photographs, e.g. whether it has led to discoloration or fading. Paper which has direct contact with photographs should be made of rags or cellulose. They consist of a high percentage of alpha cellulose (which is particularly pure), are free of lignin, metal particles, waxes and plasticizers. Ground wood-containing paper and board, photo boxes, envelopes, glassine pockets etc. should be avoided (Fig. 7). When using plastic pockets one should make sure they are free of plasticizers and solvents (i.e. no PVC material) and have no surface structure. Packaging material which touches photographs, should have no metal parts. A slightly rough and matt surface packaging material is preferable to a smooth, shiny surface, as this can result in the photographs sticking to it or the development of glossy spots. The covers should preferably have few or no glue flaps. If the products are glued, the adhesive edges should always be located at the edge and not get in contact with the emulsion. Photographic gelatine, size, methyl cellulose and some acrylic and PVA – glues can be used as adhesives. In closed boxes the objects are protected better against dust, a binder with a ring mechanism should have a slipcase to protect the pictures from dust.Unbuffered paper (pH between 7.0 and 7.5) are preferable to buffered material, especially with old methods (cyanotype, albumen papers) and colour photographs. The box material: Paper/board, which does not have direct contact with the photographic emulsion, should be buffered with at least 2% calcium carbonate to provide protection from exterior acidic pollutants. The pH should range between 7.2 and 9.5. Paper and plastics have their advantages and disadvantages as packaging materials. Paper is opaque and therefore provides UV protection, but a removal of the object is necessary for viewing. Paper provides better labelling options than plastic. It is not air-sealed and can compensate for climatic fluctuations easier. Plastic covers are transparent and the objects must not be taken out for viewing. This can be an advantage in the case of frequently used objects. However, plastic does not provide protection from light and label options are more difficult. In addition, plastic is not breathable and therefore does not provide adequate buffer in the case of climatic fluctuations. A further disadvantage is the danger of the emulsion sticking to the foil if the pressure, temperature or air humidity is too high. Moreover glossy stains may occur. Plastics such as polyesters are highly electrostatic and attract dust. Plastic sleeves should be avoided for cellulose nitrate and Acetate materials, since the gaseous degradation products of the objects can only escape insufficiently, causing accelerated decay. • Photo album: slipcase, telescope type storage boxes with hinged side panel. When archiving cellulose nitrate material particular attention should be put to the following points. Separate the objects from the rest of the collection in order to avoid damage to the surrounding material by gaseous degradation products from the nitrate materials. Use paper covers for storage instead of polyester sheets. The archival filing cabinets in which the nitrate material is stored should be well ventilated. The objects should be stored as cool as possible to slow down the degradation process. Duplicates should be made to secure the information. In addition, the legal regulations for the storage of these materials must be followed. Stable climatic conditions are very important for the long-term archiving of photographic objects. There should be no abrupt changes in temperature and humidity, even short-term fluctuations within 24 hours should be avoided. As a guideline, fluctuation should be max. +/- 2°C and max. +/- 5% humidity. Temperatures above 25°C and humidity above 60% accelerate chemical degradation processes. To monitor the climate, tests (temperature and humidity) should be performed regularly. To back up argumentation the following programs or information materials can be used: The "Preservation Calculator", the "Storage Guide for Acetate Films" and the "Storage Guide for Colour Photographic Materials". All three publications are published by the Image Permanence Institute, Rochester Institute of Technology. The "Preservation Calculator" is a free program which can be downloaded from the website of the IPI (www.imagepermanenceinstitute.org). Further help are the Standards for packaging materials and the storage of various photographic materials (see 5. literature). It should be ensured that no hydrogen peroxide H2O2 is used as an additive in the air-conditioning system. Unimpeded light exposure to photographs should be avoided. Especially high-energy UV radiation (sunlight, fluorescent lights, halogen lamps). UV protection foils or UV filters can be used for lamps, windows, frame- and cabinet glass. There are also special fluorescent tubes and halogen lamps which already have a UV filter incorporated. When photographs are presented it is not only the luminosity that is crucial, but the duration of illumination also plays a role.